When you think rental car, you usually think either tiny little box that you hate or the fastest car in the world. Either way, both are probably the same car. 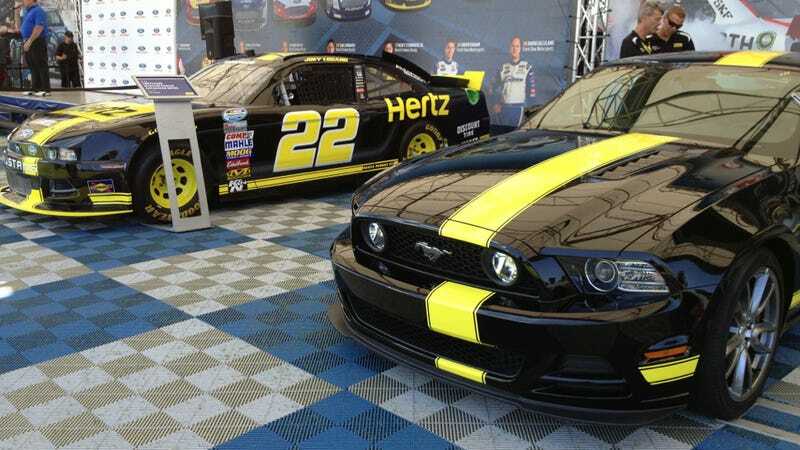 Rental car company Hertz, however, wants to bring the latter fantasy closer to the former reality with the new Penske Mustang GT. Hertz has a long history with heated-up Mustangs (among others), of course, going back to the Shelby Mustang GT-350H in 1966. There are tons of apocryphal stories from that era of Hertz Mustangs being taken to SCCA races and coming back with roll cages welded in, and the things were abused like the rented ponies they were. The new Penske Mustang GT combines elements of the regular Mustang GT with the Boss 302 Laguna Seca model that recently went out of production, starting with the 420 horsepower V8 engine. Additional accoutrements include a new exhaust system, a new intake, an upgraded ECU, and some additional suspension bits to make sure you don't fly off the road and find out what the insurance deductible is. Of course, all of this will set you back a pretty penny, with the Penske Mustang GT starting at $180 a day, or $800 a week, with a 100 mile driving limit. At that point, you might as well just go get a regular Mustang. It is only available at 15 airport locations though, so it's bound to be exclusive. Just do NOT, whatever you do, take it to the drag strip or racing in any way. That would probably violate your terms of service. And it would look too awesome. So don't do it. If you see anybody doing it, what with the smoky tires and the screeching and the noise, whatever you do do NOT send it to ballaban@jalopnik.com. That would be irresponsible. I repeat, do NOT send it to ballaban@jalopnik.com. I hear that guy posts videos all over the Internet.